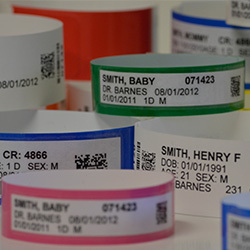 Positive Patient Identification is easy with EasyID Applications, Wristbands, Labels, Barcodes and Forms. Accurate patient identification ensures the information presented by and entered into the Hospital's EHR System is associated with the correct person. Processes related to patient identification are complex and require careful planning to avoid errors. In the EHR environment, providers rely on technology to help support and manage these complex identification processes. EasyID has been thoroughly vetted and is approved for use by all branches of the Military. "EasyID has greatly enhanced our ability to identify patients. It's a significant improvement over our old embosser..."
"This was a very important project to our hospital as our doctors were requesting this information. This is great...we are not use to saying THANK YOU...Job well done."